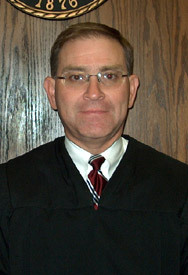 Judge Shakes has served as a District Judge since March 2003. Currently, his case assignments include adult felonies, juvenile delinquency cases, and other juvenile matters. Prior to becoming a judge, Judge Shakes was a partner in the Colorado Springs law firm of Hendricks, Hendricks and Shakes, P.C. His practice was primarily in the areas of construction and commercial litigation as well as business transactions. Judge Shakes came to Colorado in 1979 when he was stationed at Fort Carson as an Army Judge Advocate. While on active duty in the Army Judge Shakes served as a claims officer, prosecutor, and defense counsel. Since leaving active duty in 1983, he has remained active in the Army Reserve. Judge Shakes is a Colonel in the Army Reserve and currently serves as the Commander of the trial judges of the Army Reserve. While in private practice, Judge Shakes was certified as a Civil Trial Advocate by the National Board of Trial Advocacy and rate AV by Martindale-Hubbell. In May 2005 Governor Owens appointed Judge Shakes to the Colorado Juvenile Justice Council. He serves on several local committees focused on juvenile delinquency issues. Judge Shakes has been active in community activities to include Vice President (Finance) of the Pikes Peal Council, Boy Scout of America, and President of the East Colorado Springs Rotary Club. Judge Shakes graduated from Lehigh University with a B.A. with highest honors in 1975 and from the University of Pittsburgh School of Law in 1978. Additionally, he received the Master of Strategic Studies degree from the U.S. Army War College in 2003. Click the following link for information pertaining to the Public Impact Docket.